The Nintendo Switch’s first big online multiplayer game has arrived, and while many people are enjoying the upgraded version of Mario Kart 8, others are also enjoying frequent disconnects and lag. Despite upgrading and tweaking several aspects of Mario Kart 8 for the largely excellent Switch port, online multiplayer is one area that hasn’t seen much love. Getting together with friends requires coordinating somewhere other than the console, peer-to-peer connections without the ability to choose the best possible connection manually . . . it’s less than ideal. Lag’s been an issue in the past, but the Deluxe version seems to have changed up the way it’s handled during online races. As pointed out in a post over at the MK Boards, while the original game required the player see an item hit them on screen in order for it to register, that doesn’t seem to be the case with Deluxe, leading to players being hit by things they just don’t see coming. Another issue that stems from connection problems is hit detection, as told by Redditor NicholasNSane in the Nintendo Switch subreddit. Far too often I will land a hit on an opponent, usually with a visual cue that it landed, like my character cheering, only for the player to continue on like nothing happened and, in battle mode, no points being given to me. In races I will see coins fly out of a character alongside my cheer, but the driver will continue ahead and win a race that should be secured for me, yet it seems like everything always hits me with no issues. I don’t know what my hits look like on their end, but I doubt they have any idea that I’m even attacking them. Lag is frustrating, but not quite as frustrating as being disconnected in the middle of a race. I was watching streamers last night and basically every second game had them disconnected, seems like the servers might be overloaded. Since the game uses a peer-to-peer connection for online multiplayer, one possible culprit is a large influx of new players with less than stellar connections. 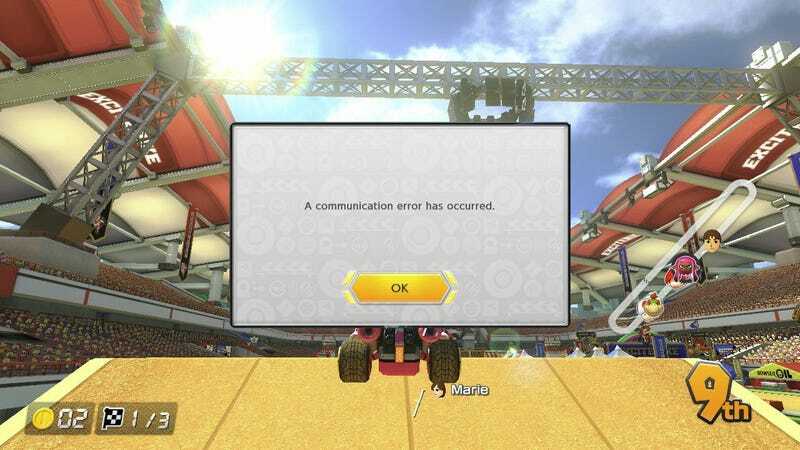 The connection error problem has been around since the Wii U release, but Mario Kart 8 Deluxe is the fastest selling entry in the series ever, and with more people comes more problems. I had no problems connecting to the game early on day one, before many players had the game, but I’ve gotten this screen twice this morning alone. Maybe when Nintendo transitions to a paid online service later this year, some of that money will go towards dedicated servers. I’ve reached out to the company for comment on the connection issues, and will update the post should they get back to me. In the meantime, how’s your Mario Kart 8 Deluxe Online experience been?